Have a friend in finance or banking? This could be a perfect bar for them. 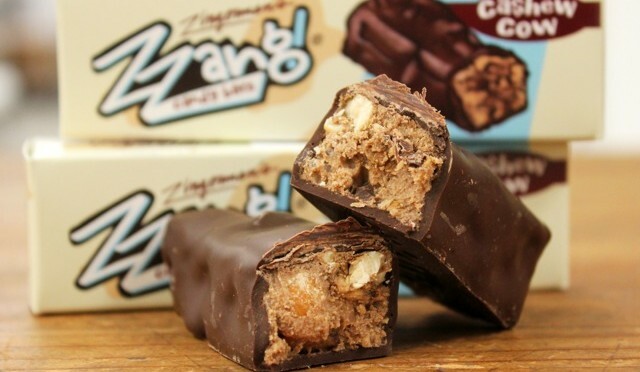 Sara, long time Zingerman’s manager, keeps one in her glove box for chocolate emergencies. You could follow her lead and give your finance friends a steady supply to keep in their top desk drawer for good luck and special powers! There’s a lot more to this bar though than just its name. We take cashew butter (the nut butter I have always thought of as the most indulgent! ), freshly roasted cashews, our own hand pulled cashew brittle (yes pulled, to get the perfect crunch when you bite it), a bit of puffed rice, and milk chocolate gianduja to make a remarkably flavorful candy interior. We cut this nutty gianduja into rectangular pieces and dip it in our favorite Ecuadorian dark chocolate. Cha-ching! This is a bar for those addicted to texture—a crisp chocolate exterior with an interior of smooth gianduja dotted with brittle and puffs. Amy, one of my partners in the candy company, loves the centers of these bars so much that she sneaks them for a special treat even before I can dip them! CONTAINS: MILK, SOY, TREE NUTS (CASHEWS).